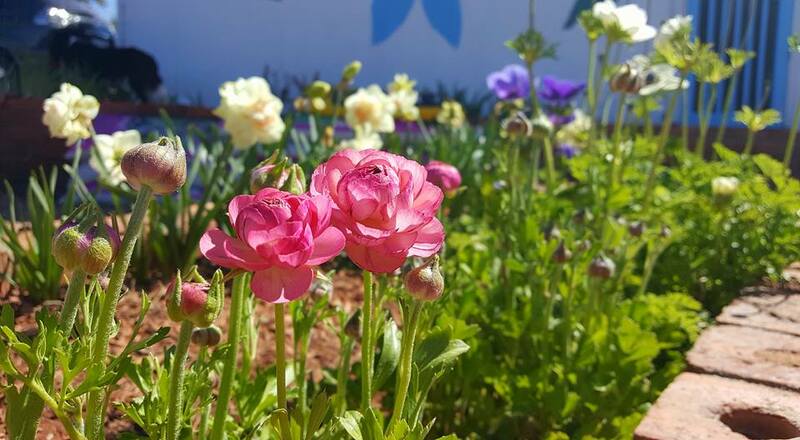 Our Botanical Aromatherapy ™ Program is a complete immersion into the world of aromatherapy, aromatic plants, aromatic gardening, sustainability, and permaculture. We believe that aromatherapists should literally go back to the roots of aromatherapy – herbalism – to appreciate the benefits of aromatherapy in all of its forms, whether that is an essential oil, or the actual plant growing in the aromatic garden. Aromatic plants can be used in many ways. Growing some of those plants teaches you to connect on a much deeper level with the plant, and totally understand how to use it. We have several paths of aromatherapy education, and various study options, depending upon your needs and interest in aromatherapy: from informal videos and articles to comprehensive college-level type papers. We will be adding further courses and workshops to our school program in the future to compliment those courses we currently offer with the botanical aromatherapy ideology. All of our programs are rooted in the traditional ways of using aromatherapy: In definition, Bo-tani-cal Aro-ma-thera-py: Plant-based aromatherapy. So, which path will you take in our aromatic garden? 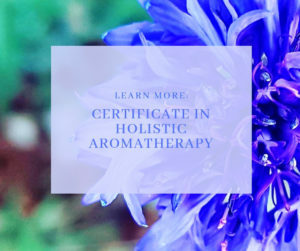 Certificate in Holistic Aromatherapy: This aromatherapy course gives the beginner to aromatherapy a comprehensive introduction to the safe and effective use of essential oils at home and for family use. It meets NAHA level 1 aromatherapy educational requirements. 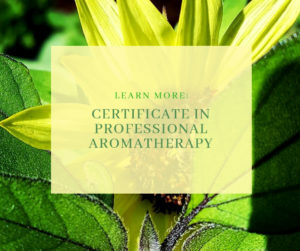 Certificate in Professional Aromatherapy: This is a professional level course that takes aromatherapy study to the next level. It gives both professionals and non-professionals a comprehensive, professional course of study in the safe and effective application of essential oils and aromatics, with an emphasis on products and their use, either in a clinical practice setting, or for use in a skin care product line. It meets NAHA level 1 and 2 (combined/course cannot be split) aromatherapy educational requirements. 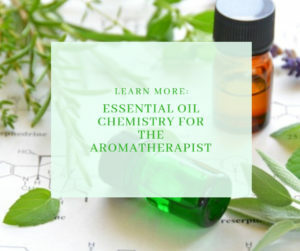 This advanced aromatic chemistry course teaches you how to improve your current blending skills with the creation of a Caddy Profile for both an essential oil and an essential oil blend. The Caddy Profiles were created by UK aromatherapist Rosemary Caddy and have been used by students for more than a decade. If you have a keen interest in aromatherapy chemistry, and how chemical components and/or individual essential oils can influence an aromatherapy blend, this course is a must. Potions from the Aromatic Garden Workshop: Learn new ways to enhance your blending techniques! Rooted in Sharon’s years of practice and experience, we will look at how to effectively blend essential oils, carrier oils, and other aromatic extractions. This workshop includes hands-on experience with plants from the garden to understand essential oil extraction, followed by in-depth profiles on individual plants/oils, and various methods of blending to produce both a therapeutic and scentful product! Secrets from the Aromatic Garden Retreat: Two days of hands-on distillation of oils/hydrosols, plant identification, and blending, in the sanctuary of our peaceful garden, studio, and workroom. 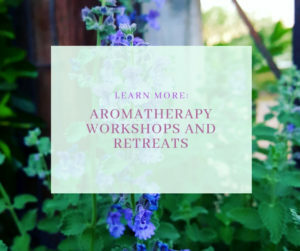 Healing from the Aromatic Garden Workshop: A workshop which addresses the power of healing with essential oils for the emotional abuse and resulting trauma of domestic or intimate partner violence, bullying, PTSD, and life-threatening illnesses. This workshop is suitable for those working with trauma survivors and/or if you are embarking on a personal journey of healing due to trauma. A Virtual Connection to our Aromatic Garden! 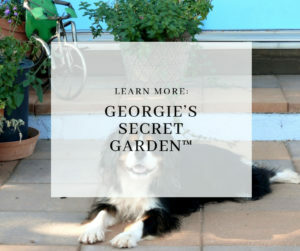 This is a subscription club style of learning which gives you access to the “secret garden” of Sedona Aromatics. Discover aromatic articles, plant and oil profiles, short tutorials, videos from the aromatic garden and stillroom, and how-to tips (on aromatherapy blending and aromatic gardening) not available publicly on the website. You will also receive a once-a-year wellness box in the spring, packed full of aromatic goodies from the blending room and garden. And, should you wish to take a home study aromatherapy course or on-site workshop with us, you will receive access to exclusive discounts to be used against these options.